If you wanted to make money selling pears, the River Raisin Valley Nurseries recommended growing Clairgeau de Nantes trees like the one in this vintage pear tree drawing. Pierre Clairgeau developed this variety in Nantes France. The pears were a lovely golden yellow with a highly colored red cheek. Highly flavored and one of the heaviest bearers, yet these trees often produced fruit where others failed. 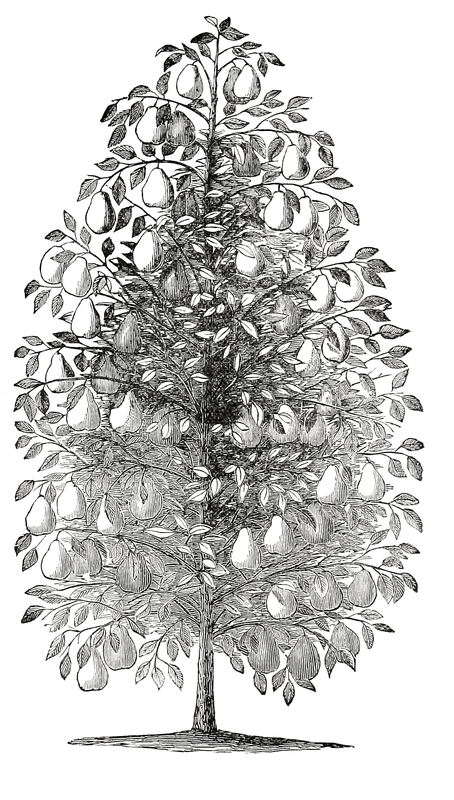 River Raisin Valley Nurseries offered trees for sale for the first time in 1893; when they included this pear tree engraving in their catalog. They even offered to send samples of the fruit to any one desiring to see and taste it. I’m sharing with you a lovely pear tree engraving. Thankfully, the scan was huge, so the picture you see below is not the best image I have. Simply click on what you see and you’ll access the original image. When printed, it covers an entire sheet of paper! The tree drawing shows a tall, pyramid-shaped tree, heavy with fruit. I think it has the silhouette of a Christmas tree and maybe could be used for a holiday project too. This pear tree engraving, like so many 20th century engravings, had some places where the ink bled. I’ve erased a few stray blobs and added a little more color in some places. But, for the most part, I’ve left this beautiful vintage catalog illustration as I found it.